In a large mixing bowl, soak curl dust and crumbles in veggie broth, soy sauce, and liquid smoke for 8 minutes. In a skillet over medium heat, cook garlic, celery, and onion for 3 minutes, then add 1/4 cup water to prevent browning, cook another 3 minutes, until onion is translucent. OR sauté in olive oil, do not add water if you do this. Remove from heat. Preheat oven to 375ºF. Once curls are rehydrated, crumble tofu over them; stir in oats, mustard, ketchup. Add spices and cooked veggies. With a clean hand, mash, squeeze and stir until well mixed. Spread meatloaf evenly into a silicone 8×4-inch loaf pan. Bake 25 minutes. Remove from oven; drizzle top with as much ketchup as you like. Return to oven. Continue baking another 25 minutes. Allow cooling 15 minutes before cutting into it. This loaf is moist after baking. A night in the fridge firms it up perfectly. If you have the time, make it a day ahead. Slice it up and reheat it either in the microwave or toaster oven. 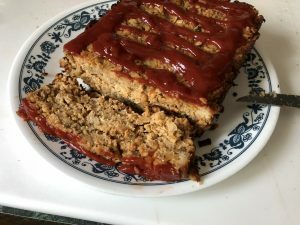 Cold leftover meatloaf is excellent! Hopefully, you will have leftovers to enjoy the next day.